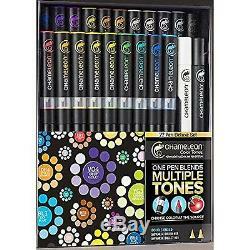 The Chameleon Color Tones 22 Pen Deluxe Set. The 22-Pen Deluxe Set is the feature pack of the Chameleon Color Tones Product Line, giving you the full range of markers, plus a Detail and Toning pen. The easy to read deluxe instructions, with useful hints, tips and techniques complete the set. The clever storage box doubles for a simple horizontal work station for easy access to your markers. The 20 vibrant colors produce over 100 color tones giving you the ability to create stunning effects such as 3D, smooth transitions, highlighting, shading, gradations and blending, all with one pen. Each pen goes from as light as a hint of a tint to rich tones, eliminating tonal gaps in your collection. The Chameleon Color Tones 5 Pen Tone Sets. The four 5-Pen packs are a great way to get into the Chameleon Color Tones range. These packs are made up of the 20 Chameleon pen colours, broken down into 4 individual sets; Pastel Tones, Primary Tones, Earth Tones and Cool Tones. Each pack is complete with detailed instructions that have useful hints, tips and techniques. The 5 vibrant colors produce over 25 color tones giving you the ability to create stunning effects such as 3D, smooth transitions, highlighting, shading, gradations and blending, all with one pen. The Chameleon Color Tones 5 Pen Cool Tones Set. The Chameleon Color Tones 5 Pen Earth Tones Set. The Chameleon Color Tones 5 Pen Pastel Tones Set. The Chameleon Color Tones 5 Pen Primary Tones Set. Japanese SuperSoft Brush Nib and Bullet Nib. Compatible with all other Alcohol-Based Inks. Ideal for All Paper Crafts, Manga, Graphic and Fine Art. Chameleon Color Tones nibs are specially designed Japanese nibs that are created to ensure perfecting blending and coloring. The Japanese SuperSoft Brush Nib gives the user a paint brush feel. Perfect for bigger color gradations and seamless blends. The Japanese bullet nib is a firm nib, great for outlining, drawing and filling in small areas with precision coloring. The Mixing Chamber Nib while Durable needs to be removed when refilling the mixing chamber, over time they may get damaged or worn but can easily and affordably be replaced when needed. Chameleon Tweezers are the ideal tool for removing nibs to either replace nibs or refill your pens. The Chameleon Tweezers have a unique ergonomic design that means not only are the comfortable to grip but they are work perfectly whether removing your Chameleon Pen nibs or your mixing chamber nibs. To remove nib gently grab the base of the nib where it meets the pen. Once the curved tip is in place firmly squeeze the Tweezer and gently pull to remove the nib. Note : For refilling- To prevent any damage to the brush nib remove the bullet end of the nib to refill. The item "Chameleon Colour Tone Permanent Ink Pens Colour Changing Markers" is in sale since Wednesday, March 02, 2016. This item is in the category "Crafts\Art Supplies\Drawing & Lettering Supplies\Art Pens & Markers". The seller is "clic-art" and is located in Nottingham, Nottinghamshire. This item can be shipped to United Kingdom, Austria, Belgium, Bulgaria, Croatia, Cyprus, Czech republic, Denmark, Estonia, Finland, France, Germany, Greece, Hungary, Ireland, Italy, Latvia, Lithuania, Luxembourg, Malta, Netherlands, Poland, Portugal, Romania, Slovakia, Slovenia, Spain, Sweden, Australia, United States, Russian federation, Canada, Brazil, Japan, New Zealand, China, Israel, Hong Kong, Norway, Indonesia, Malaysia, Mexico, Singapore, South Korea, Switzerland, Taiwan, Thailand, Chile.